Bog Mill Farm Holiday Cottages are two holiday cottages converted from 18th Century farm buildings. The Cottages are located in countryside 2 miles East of Alnwick town and close to the river Aln. Phone, e-mail and post are available for booking. Payment may be by cheque payable to Bog Mill Cottages or by bank transfer. Guests own personal transport is best for enjoying the comfort of the cottage as it is situated down a gravel farm road 400m from the A1068 Alnmouth Road. Public transport is available on the Alnmouth Road for bus transport. Trains at Alnmouth Station (2.5 miles). Local taxis including accessible taxis are available by telephone booking. Alnwick Town, Alnwick Garden and Castle are accessible by footpath and bridleway along the bank of the River Aln (2 Miles). Car Parking is immediately adjacent to the Cottages and is a gravel surface. Two spaces for the Granary and one for the Byre there is ample space for loading and unloading. Car parking area and access to cottages is lit by motion sensing lighting. The paths to the cottages are paved. Additional car parking is available not adjacent to the Cottages. On arrival guests will be met by staff and shown the cottage and operational procedure for the accommodation. Exceptionally a keysafe is also available but personal welcome is prefered. Two steps access the front door with handrail to the hall where emergency lighting is available ( torch) and a mains smoke alarm situated. Additional key(s) are available if required. An under stairs cupboard houses vacuum cleaner, iron, ironing board and clothes airer. Bedrooms and bathroom are accessed from the hallway. Bedrooms and Bathrooms are on the ground floor and have a Double Bedroom with King size bed and en-suite Shower room and a Twin Bedroom with own bathroom including double shower. The living accommodation is on the first floor with access to the garden down an external flight of steps. The accommodation is open plan with a lounge, dining and kitchen area. The kitchen has gas hob and oven, microwave, extractor hood, toaster, refrigerator and freezer, washer drier and dishwasher. A fire blanket and fire extinguisher is located in the kitchen area. An additional mains interlinked smoke detector is located in the lounge area. The garden has lawn, flower border and patio area with table, and comfortable chairs. The front door is accessed by two steps into the entrance hall, with emergency lighting (Torch) and hanging space for outdoor clothes and shoes. The Bathroom is accessed from the entrance hall and has a walk in shower, cast iron roll top bath, basin and toilet. A hanging airer is also located in the space above the radiator. The boiler is located in the bathroom. Two steps from the hall access the living accommodation. It is open plan with kitchen, lounge and dining area. The kitchen has gas hob and oven, microwave, extractor hood, toaster, refrigerator and freezer, washer drier and dishwasher. A fire blanket and fire extinguisher is located in the kitchen area. The bedroom is accessed from the open plan living area and has double bed with wardrobe and dressing table. The garden has lawn, flower border and patio area with table and chairs. The cottage has Mobility One grading but is regularly used by guests in a wheelchair. There is level access from the car park to the front door or to double patio doors. The entrance hall has storage for shoes and outdoor clothing, emergency light (torch) and a mains smoke detector. The downstairs bedroom, bathroom and living area are accessed from the hall. Downstairs doorways are widened to allow wheelchairs. The bathroom has walk in shower, bath, basin and toilet. Grab rails alongside shower, bath and toilet. This has a fourposter double bed, wardrobe, dresser and drawers. The living accommodation is open plan with a kitchen, lounge and dining area. There is an additional mains interlinked smoke detector. Double Patio doors lead to a patio area, which overlooks the river Aln. The kitchen has gas hob and oven, microwave, extractor hood, toaster, refrigerator and freezer, washer drier and dishwasher. A fire blanket and fire extinguisher is located in the kitchen area. The boiler is located in the kitchen area. Stairs from the lounge area lead to the second floor which is separated, from the living area by walls and solid double door. A stairgate is also a permanent fixture at the top of the staircase. There is lounge area and twin beds. The garden has lawn, flower border and two patio areas with table, sun umbrella and chairs. 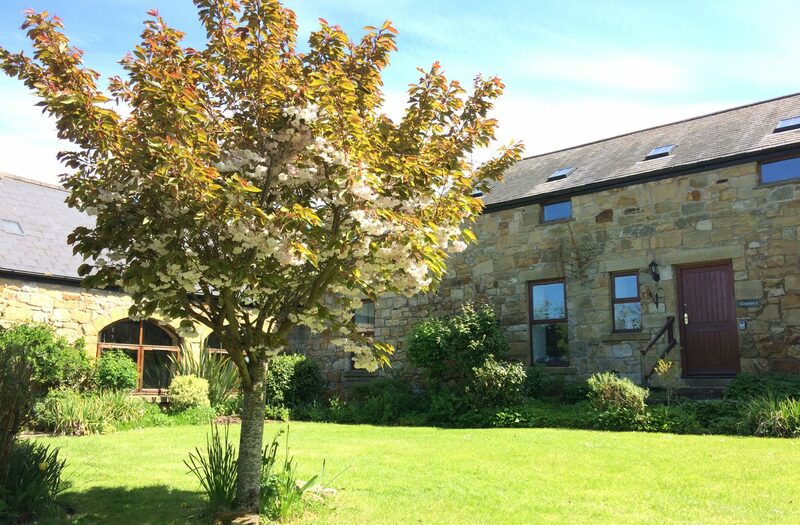 Bog Mill holiday Cottages, Bog Mill, Alnwick, NE66 3PA. use NE66 2PB on A1068 and turn left down track to cottages. Directions from Alnwick, at the Oaks Hotel take A1068 towards Lesbury from Alnwick , 50m past the speed de-restriction sign turn left down track. Directions going east on A1068 from Lesbury, when approaching Alnwick turn right down track 50m before the 30mph sign.